Share the Love of Theatre for Valentine’s Day with a Special Offer! Posted on February 12, 2018 by dshaw12 | Comments Off on Share the Love of Theatre for Valentine’s Day with a Special Offer! Almost, Maine is all about love. What better way to see the show than by using a Valentine’s Day Special Offer? Buy one or more tickets and get one in your order for 50% off. Visit our ticket page, place your order online, and enter discount code VDAY2018 during your purchase to receive your discount. Limited Time Offer: Only good for tickets purchased between Mon, Feb 12 and Wed, Feb 14. Does not apply to previous purchases. Comments Off on Share the Love of Theatre for Valentine’s Day with a Special Offer! At our Annual General Membership Meeting on 11 December 2016, we approved the plan for the shows that we will present for the next season in 2017-2018. Now we need to find directors, choreographers, and musical directors for these shows. Another Nunsense show in spring 2018, continuing the series. Nunsense Jamboree features the funny nuns and country music. We are in need of a Musical Director and a Choreographer. We probably have a director. We are also at present still in need of a Choreographer for this season’s production of Nunsense 2 in spring 2017. Honorariums are given for the artistic staff positions. And of course we will need supporting staff for all of these shows: producers, stage managers, set builders, and designers for sets, costumes, lighting, props, etc. If you are interested in any of these positions, please contact us at TCSaugus@gmail.com. Please attach a theatre resume, and a letter indicating which jobs and shows you are interested in. We will arrange for an interview with our board of directors. Thank you! Exelon is an electricity supplier available to customers in Massachusetts and other states. They have a Community Champions program that awards grants to non-profit organizations for local projects. For the second year in a row, they have awarded $500 to Theatre Company of Saugus to support our Youth Theatre Workshop 2016. This will help us ensure that we will have a successful workshop and we can put on a better show with our kids. We Thank Them Very Much. Here is a link to the announcement of our 2015 award. Here is a link to the Exelon grant program. Theatre Company of Saugus is excited to announce auditions for our upcoming spring production Urinetown, a side-splitting send-up of greed, love, revolution (and musicals! ), in a time when water is worth its weight in gold. Auditions are February 16, 21, 23, 2016. The audition location is the Laurel Gardens Community Room in Saugus. All roles are open. Performances are April 22-May 1, 2016, at Saugus High School. For information about the show and the TCS production, see our Urinetown page. For complete information about trying out, and to sign up for an audition time slot, see our Auditions page. For how to get to the audition location, see our Directions page. Posted on March 6, 2015 by lsegel | Comments Off on Audiences love The Underpants! We are enthralled watching the talented cast of our winter show, The Underpants. This is a hilarious farce by comic performer and writer Steve Martin, adapted from an older German play by Carl Sternheim. Remaining performances are Friday & Saturday, March 6 & 7 at 8:00 PM, and Sunday, March 8, 2015 at 2:00 PM. Tickets cost less if you purchase them in advance! For full details, please see our Tickets page. 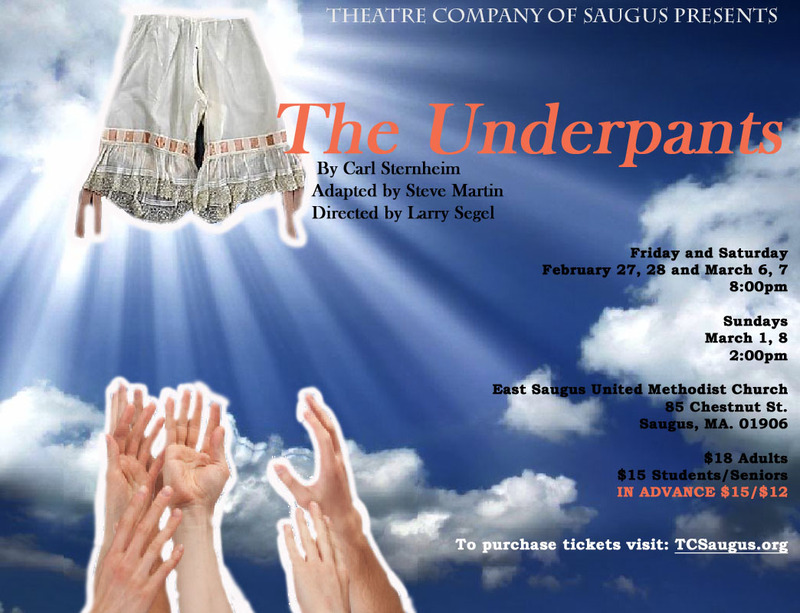 For information about the show please visit our The Underpants page. See our Directions page for info about finding a place to park. Comments Off on Audiences love The Underpants! TCS will hold our annual summer Car Wash on Saturday, July 19, 2014 from 9:00 AM until 2:00 PM. 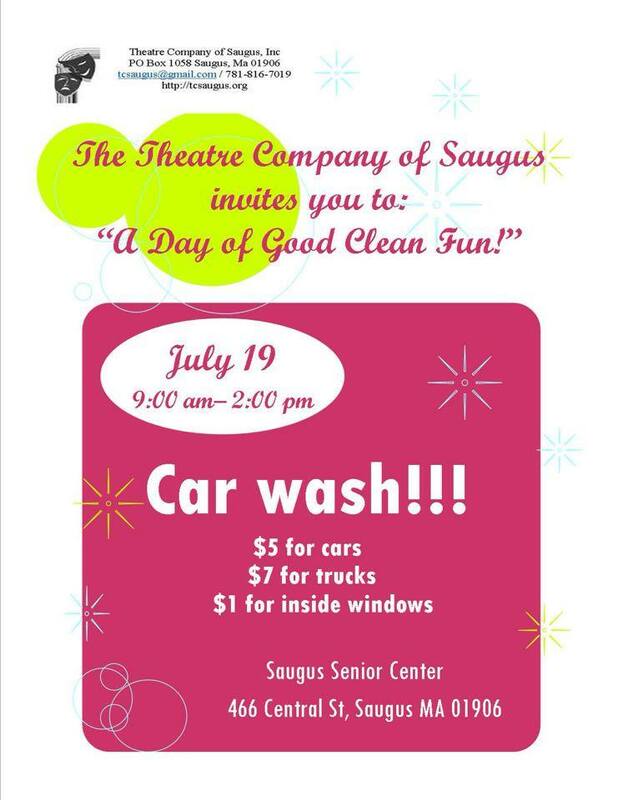 The location is the Saugus Senior Center, 466 Central Street. Only $5 to wash your car, or $7 for SUVs, trucks or vans. $1 to clean inside windows. Come help us out and have some good clean fun! If you are interested in assisting, email us at tcsaugus@gmail.com. But even if you can’t come down and help wash, bring your car down so we can clean it up for you. Your car is dirty and needs washing. Proceeds will benefit our summer Youth Theatre Workshop.